Starcraft II: Annihilation is my single-player campaign project for StarCraft II. The campaign contains +20 missions with many different mission scenarios, as well as three intersecting storylines. More info can be found on my main map page. I just released the completed version of the very first mission and would like to get you guy's opinions on how well I did. How well did you enjoy the mission, and was there anything particular you liked or hated? Don't be afraid to criticise. If there's something you thought was absolutely terrible, then go ahead and say it and explain why so I can improve future missions. Now, I know I said "completed" version of the first mission, and even though I have tested everything there may still be minor bugs and other things that needs to be fixed. This map should be defined as "Beta". Download the first mission here. StarCraft II: Annihilation Campaign - A 24 mission single-player campaign featuring unique heroes, custom tracks, boss battles, a varied set of mission scenarios and three intersecting storylines. I quite enjoyed it. But the camera is zoomed in really close, which becomes weird in the very end of the mission, where you have an actual base and an army. You can probably find a better model for the infested boss somewhere here on master, by the way. This first mission does leave me wondering, when the hell this takes place within the lore and if Baldwin's backstory relates to the Guild Wars and what this rebel group is to the Dominion. All the established lore – you can connect it to your campaign and it would help out with understanding the situation. Also, is Reeves a ghost? I hear an ancient voice, whispering from the void. and it chills my lightless heart. Adun Toridas! I actually completely forgot to change the camera height lol. I guess it was because I had been testing the map so often on that height that I kinda got used to it. I'll change it asap. And for the boss, I do agree it doesn't look AS good as it could. The fact is, this was my first boss battle and I just wanted to try it out and see how it would work in my map, and as a result, I picked an existing, and very simple model with a slightly different color scheme. I can definitely change it later though. To answer your questions regarding the lore and the storyline: Even though I didn't specify the time, my vision was to have it take place a few years after the events of HotS and possibly LotV. Baldwin's backstory does not really relate to the Guild Wars. The "Old War" was a specific war that took place a few years before the start of this campaign. You will get more information about this later in the game, because it will play a decent role in how Baldwin as a character, and also other members of the CPG Rebels will function. Reeves is a ghost. He just works for a specific covert-investigation organization instead of the regular Ghost Program. Well, I'm not gonna lie, that was all sorts of amazing. I don't know what I expected, really. Noticed the thread before I went for a swim, made a mental note to play it when I got home, and I am glad I did. If the first mission of this campaign is any indication of what's to come, I am very excited indeed. Now, let's get down to the juicy stuff, shall we? The loading screen is interesting. I will admit to finding it a bit odd that it was a snapshot from the gameplay. A screen from one of the cinematics would have looked cooler, to be honest, but that's me. I liked the intro. There were some cool touches, and you handle the camera well. The surveillance overview was awesome, and would have been even even more so if you shook the camera just a tiny bit, making it look a bit more like we were hovering (see the intro to HOTS mission 3). But that's just a small suggestion. Cinematics in custom campaigns are often very clumsily made, but not yours. Also: I must admit to not being a great fan of center left portraits in cinematics (I prefer bottom left). More important than that is the fact that I was captivated immediately by the characters, the story and the atmosphere. There is something so very interesting about an investigation, and I am intrigued to see where it is going. The mystery of it really dragged me in. It helped, of course, that the terrain is simply top-notch. I rarely find myself wanting to explore the back alleys and dead corners of a custom mission, but in your cause, I found myself searching almost every inch of the map. On one occasion that proved to be quite rewarding, as I found some new teammates. But even when my search yielded no results, I didn't find myself disappointed, as there usually was some beautiful terrain to marvel out (which made it look like the world you created existed beyond the boundaries you have set for it). The flashbacks were awesome. The sharp juxtaposition between what happened to the various locations and what had became of them later struck a chord in me. I watched with dread when a fully operational base had turned into a massive graveyard. I also liked that we got some insight into the characters' background. The characters were sharply drawn, and I found myself engaged with them, which is crucial in a campaign (I personally believe the greatness of custom campaigns often rest on the shoulders of their characters). When we got to the mysterious device, I found myself thinking, "Whoa, dude, what is that?!" It looked really cool. It's the Psi Destroyer from HOTS, isn't it? I didn't recognize it at first, which added to the effect. I loved that there was a second part of the mission. It worked great too, although I have a few nitpicks. I'll echo Flinkelinks about the camera. I found it to be too close in the first part of the mission, and it was very distracting in the second. I love the zoomed-in camera too, but I prefer a middle ground. What I do is just copy the default camera from missions like Piercing the Shroud and Belly of the Beast (or you can just plug in the numbers yourself). The zoomed-in camera works wonders with micro missions, but if there is a macro element, I personally prefer the default settings. Also: Marines had stim, but it couldn't be researched and therefore wasn't available for use. In addition, the tank by the rock was looking the wrong way (sometimes, it even rotated its cannon in a circle). From a gameplay perspective, though, the second part was great. I love survival missions; they're so intense, and you built it up really well. Also: the boss was a nice touch (although he went down easily, as he decided to pay a visit to all the mines I had placed on the low ground, instead of going straight for the ramp, which I found odd). The nydus worms were awesome as well, as they forced me to move out from the comfort of my base. Overall, a nice job. Can't wait to see what comes next! The Loading Screen - To be honest with you, I've gone through a lot of iterations about what to use as the loading screen. I took around 5 - 6 screenshots and speculated, and it eventually led me to choosing that one. Might not be the best though, I just really liked it because I managed to capture it with perfect timing, so I got that maximum effect. 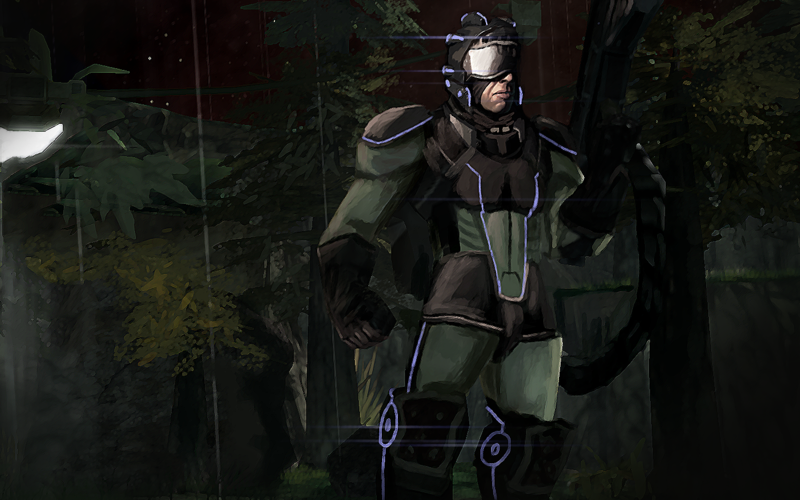 I will make the loading screens different for each level though, so mission 2 might have a scene from a cinematic. It just depends on what I feel looks best. Yes, that was the Psi Destroyer. I thought it had an awesome model, and it with a little resizing, it suited perfectly for the map. As I said to Flinkelinkes, the many test runs I had been doing on the zoomed camera made me used to that view, so I completely forgot to change its height in the second part of the mission. I don't know if it's too low though in the first part of the mission. That might just be me, but I thought that distance worked perfectly even during early testing. About the bugs - With the marine stim, what exactly do you mean? Could you press the button but nothing happened, or was it greyed out? The reason I ask is because I noticed if you have both Barry Baldwin and a Marine highlighted, you could switch to a marine in the subgroup and actually see the button available for use, but if you press it, it will activate Barry Baldwin's ability. I'm still trying to work this out though. The same goes for the Siege Tank weapon. I'm working on fixing this. I hope you understood what I meant. If not, tell me and I'll try to explain it in a better way. The boss was kinda added as an experiment. I wanted to have really intense ending to the mission, and that's why I added the boss. It was a very simple boss though, it was more or less just to try out how I could make it work. I will definitely try to improve bosses for future missions. Btw, Crimson Moon and Amber Sun was kind of a multi-perspective story wasn't it? I mean, sometimes we get missions with Henderson, then Janus and even Bayo. I just use different races instead of different characters. I'm not sure I understand the issue here. Can you elaborate a little bit? What wasn't working, the Difficulty choosing menu? @EivindL: Go The Loading Screen - To be honest with you, I've gone through a lot of iterations about what to use as the loading screen. I took around 5 - 6 screenshots and speculated, and it eventually led me to choosing that one. Might not be the best though, I just really liked it because I managed to capture it with perfect timing, so I got that maximum effect. I will make the loading screens different for each level though, so mission 2 might have a scene from a cinematic. It just depends on what I feel looks best. This is just me, but I would have chosen the underhead shot of Reeves in the intro. It looked awesome. That, or something like the dropship flying in. The problem with using a gameplay shot is that the command menu kinda looks awkward under the loading bar (it clashes, which is not an annoyance you will be faced with if using a cinematic shot). About the bugs - With the marine stim, what exactly do you mean? Could you press the button but nothing happened, or was it greyed out? The reason I ask is because I noticed if you have both Barry Baldwin and a Marine highlighted, you could switch to a marine in the subgroup and actually see the button available for use, but if you press it, it will activate Barry Baldwin's ability. I'm still trying to work this out though. I meant that it was greyed out. I thought perhaps we would be able to research it later, but we couldn't. I liked the boss, I just found it odd how he would go after the mines, as if he had a detector or something that would push him in that direction. That's true, didn't think of that. All my story-lines were told from one side, though. I'm suspecting it's not that way with you, or am I wrong? That's actually a pretty good suggestion. I guess the bar does get in the way a little. I'll definitely consider it. Oh, that's just because I made the upgrades like they are in multiplayer, where you can see them before they have actually been researched. However, I decided to prevent the player from actually being able to research it, as I felt it was a little powerful for this mission. Hmm, that's an interesting find. He shouldn't be doing that. I'll look into it. Every race has more or less their own story, but the stories do connect to each other in various ways. Some of the information you get on one mission, might actually only end up making sense a few missions later, where you play another race and experience another side of the story. Then I suppose you should remove the button. Looks kinda odd to have it there. As I said, I couldn't access my cursor- I couldn't see it or select an option with it. That's a really weird bug. That hasn't occured to me before. Did you try restart or anything? Feedback on the first mission has been great so far, and I've been able to improve it a lot thanks to all you guy's suggestions. Thank you! Added a Move effect to the surveillance camera in the Intro Cinematic, so it looks more as the ship is actually hovering. Changed the camera height of the macro-part of the mission, so it's not as zoomed as it is in the current version. Attempted to improve the final boss AI a bit. Also, I've begun making the terrain for the second mission "An Unfriendly Ally" and it's looking quite good at the moment. Sounds good. Can't wait to play the next mission. I like the title! Sounds promising! By the way, how much of the story have you planned ahead? Hello again. I felt inspired to make a loading screen from the intro cinematic so I derped around with Photoshop for a bit but it didn't turn out as well as I had hoped it would. Nevertheless, I hope you like it. I had the same problem as metalking, couldn't see or use my mouse cursor. When hitting enter to type a message, however, the cursor will appear and then it can be used. I don't like how zoomed in the camera is. At the the part where you attack a hatchery. Maybe give the larva less health/armor so the ally units aren't sitting there shooting them for so long. Aww, Maxwell died going after a nydus worm with friends while defending the base. People usually don't like to replay a mission to get back to where they were, and since Blizzard doesn't allow map makers to use a checkpoint save system, its probably best to make some sort of revival system. Edit: I added the show/hide mouse cursor action after cinematic mode was engaged in the Dialog - Difficulty Choosing trigger, and that fixed it. You would want to add the action again after a difficulty is chosen to hide it though. I'm surprised other people were able to see their cursors during cinematic mode, as I've been used to it always being hidden during it. I have planned the overall idea of how I want each mission to progress, however many details are still missing. I have details of the first 4 missions so far, but I normally get even more ideas as I develop the terrain. I also have the ending planned, but even that is still in planning and without many details. Believe me, I would love to do actual voice acting for the game, and during planning of the first mission, I actually recorded some unit sounds for Reeves, but I ended up scratching that idea completely as it didn't sound too good. Unfortunately, that is out of my power. I simply don't possess a good enough program or microphone to stuff like that. On the other hand, I don't personally feel like the lack of voice acting is the biggest problem. It may be a little harder to watch the actual cinematic to begin with, but I mean, there's always the option to replay later. I've heard a couple people so far complain about the zoomed camera. I'll look into it, but I don't want to raise it too high either, since I think the zoomed camera is a really cool element for micro missions. I'll see what I can do. I didn't find that to be an issue at all. I just used to Reeves since he one-shots them, and then that solves the problem instantly. As EivindL said, saving is your friend. I think that's really the best solution to that issue. A revival system just doesn't suit in a campaign mission if you ask me. Saving is much easier too. Quite a few people seem to be having this problem it seems. I'll see what I can do, but it's hard for me to actually confirm if I fixed it, since I'm not having that issue at all. I find it rather strange that so many people have it that way. I suppose saving is less of an issue, if you don't ever plan on it being something for the arcade. Just finished it, have to say it was very interesting. I liked the terrain, especially the atmosphere. You really captured the feeling of gloom/desolation that a ruined and infested colony should have. The before/after flashbacks were a nice touch as well! - There seemed to be that Actor Errors message box on the top left when the game started, something about Missile Turrets, Bunkers and Archons? Also, what's that "USER" box on the top right? - Reeves' wireframe doesn't seem to have any border, looks rather weird when other units are selected. Also, Barry's wireframe has a blue border? - While I liked the Nydus Worms, I think they could've been done better. Like, instead of spawning a mass of units instantly, why not have them spawn the units over time in low intervals? (and play that spitting animation/unloading sound effect) That would look much better, in my opinion. Yeah, I realized myself that that was a rather bad screenshot, after hearing some people complain about it. I have already changed that in a newer version not released. I have absolutely no idea why they are there and it annoys me so much, because I don't know how to fix this issue atm. I've searched through triggers to find something like error message/actor message but no success thus far. It appears in every map I make for some reason. Both of these were done deliberately. The reason being is I wanted for people to be able to easily distinguish between Hero units and regular units in subgroups, and the reason for the black (That's why you can't see it) and blue colors, is basically because of that's the color I chose for Baldwin and Reeves, again, to make them be easily distinguishable on the field. Thanks for notifying me. What a nice find. I have no idea how I didn't notice that myself. I've gone through the triggers and changed that so it displays 30 health on the tip too. I've been working on fixing this issue. I copy/pasted their weapons and changed them so they could attack invulnerable units, that's it. I don't exactly why it caused the Reapers and Siege Tank to do that. I might have to go through the weapons again to see why the Reaper's doesn't play the animation, as it bugs me too. Regarding the Siege Tank, that I've been attempting to fix too, but that is one of the more annoying bugs. I'll keep working on it. That's actually a nice suggestion. That will clearly make more sense too. The reason I did it the current way was pretty much because it was easier to just spawn a bunch of units at once and then check every few seconds if the Nydus Worm is still alive. With the other way, it get's a little more complicated. I'll probably try to do it when I have time.